Absent a more creative solution, the current Federal Government shutdown will continue until a new appropriations law is passed by Congress and signed by the President (or veto-overridden). The Patent Office (USPTO) is caught-up in this, but in a little bit of a quirky way. The USPTO is a fee funded agency. Generally, patent applicants pay the USPTO, and the USPTO uses that money to pay the examiners. However, Congress has not provided USPTO with authority to simply spend whatever it collects. Rather Congress declares annual appropriation amounts that may be spent – if collected. If the USPTO brings-in more funds than appropriated then it can put those funds in a “Patent and Trademark Fee Reserve Fund” held by the US Treasury. And, under the Patent Act, the USPTO can only spend funds that have been appropriated to the Agency. 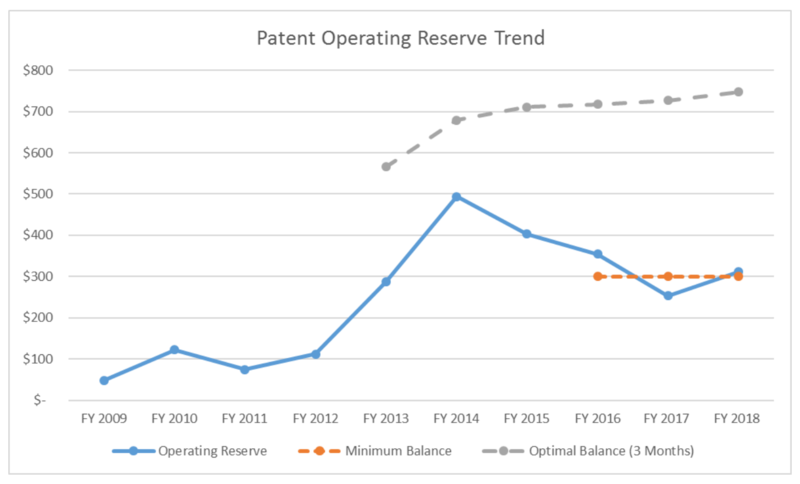 As a consequence, the USPTO cannot spend new-money coming in the door and it cannot spend money in the aforementioned Reserve Fund (that is empty anyway). So, how is the USPTO Operating: The USPTO has continued to operate for the past 25 days without much of any slowdown — paying its employees and contractors. Over the past several years, the PTO has begun placing some amount of appropriated spending into an “Operating Reserve” — treating the money as spent for the purposes of appropriations, even though it hasn’t really been spent. The Administration has determined that it is proper to save that money on an annual basis and to spend the money now on operations despite the lack of an appropriations bill. This same approach has been used in the recent prior shutdowns as well and is a primary justification for the fund in the first-place. Although the Agency’s goal is to have three-months operating reserve, it only had about five-weeks set aside (~$320 million) at the start of the shutdown. Funds have not yet run-out, but they are now dwindling. The chart below comes from the 2018 PPAC Annual Report. In that report, the PPAC suggested that the optimal balance be boosted to $700 million+. Once the reserve reaches that amount, the PPAC would then consider suggesting reduction in fees. Congratulations to the PPAC members, PTO Directors, and especially Tony Scardino (PTO Chief Financial Officer since 2010) for their forethought and dedication to this important issue that is now serving the patent community. To what extent is “keep a small-staff working … unpaid [)] ‘to receive new applications and any other examination, post-examination, post-issuance, and PTAB or TTAB filings; receive payments related to such filings; and maintain IT infrastructure, among other functions'” reconcilable with the Antideficiency Act? The PPAC proposed increased fees in order to increase the reserve. If the reserve is depleted (maybe completely…or more), how does this affect the proposed fees, some of which are not well justified? If the PPAC had said the pretty much all the increased and new fees should be justified under increasing the reserve, that would be one thing. But, the new annual active patent practitioner fee with “optional” CLE “discount” was justified for “increasing the quality of the bar” and funding the OED. Since the OED doesn’t seem to need an increased budget (or, at least, the PPAC didn’t show us why it would), and there was no evidence that a fee would increase the quality of the bar (or that there’s necessarily a need to increase the quality of the bar), there seems to be little justification to implement ALL of the proposed fee changes. And, given that the proposed fee changes are not intended to start a reserve from scratch in any case, this may be a long term problem (especially since the government seems to shut down every year, and we can certainly expect a new tantrum at any given moment). For those who don’t think politics are a problem in this situation, or think that the backlog will only result in a delay in patent prosecution by an equal amount of time, you’re thinking WAY to linearly. We’ve had 2 shutdowns at budget time in a row, regardless of party power balance. We’ll have another in less than a year unless something monumental happens. I won’t hold my breath, though. Welcome to the new reality. Where facts don’t have to be facts. Well, if you’re the right person. Ordinary folks shouldn’t expect to get away with it. Even hotshot patent prosecutors! The FCC turned off its fee filing system when it shutdown. I wonder if the patent office will do the same when accepting new applications and responses. Unprecedented is getting to be a lame word. California Gov. Gavin Newsom says the Trump administration has told states they can’t offer unemployment benefits to federal employees who are required to report to work without pay during the government shutdown. Nice try by the administration but California will ignore this. Red States, on the other hand, should feel free to flush their citizens down the t0 ilet. They asked for it! Enjoy. Too bad about the children. The shutdown is a gambit to eventually privatize the NPS, the NWS and airport screening. It might even be a gambit to convert the patent system into a registration system comparable to copyrights. There is no valid absolute certainty that the PTO will reopen if it should enter the shutdown. The administration is not that clever, not by a long shot. Perhaps some other slick grifters are contemplating maneuvers like this, but definitely not Perznit Dum psterfire. But he’s not going to win. Unfortunately he’s also not going to blow his brains out, which would be the best thing he could for the country. So someone may have to do that for him. Probably will end up being someone in the military. You really shouldn’t permit MM to continue to post. It is just ridiculous that MM posts the same propaganda day after day. There is not defensible position that it is possible to have new functions without new structure. None. Plus he misrepresents functional claiming in that all the art units have functional claims including claims to molecules for the exactly the same reason. There are too many solutions or atoms that could go there to explicitly claim the structure. Magic boy should be banned until magic boy decides to start honest conversations. I’d ban MM for the mere fact that he spells like a 10 year old. I skip over all of his comments now–reading them hurts my brain. I wonder if someone with a programming background can put a script that causes his comments to not be displayed. There are too many solutions or atoms that could go there to explicitly claim the structure. This sounded a lot more compelling in the original crayon. Engineers, they always have a card to play. I spoke to an Examiner this morning who said they’d be packing it up the first week in February if nothing changes. Oh well. As the very serious “anon” informed us, there’s no real difference between a granted patent and “patent pending”. Good time for a vacation! If you can afford one. I don’t recommend a national park. Again with the misrepresentations. Nowhere did ever say or even remotely provide an implicit statement that a patent pending is entirely equal to a granted patent. Don’t you realize that it is YOU that suffers lack of credibility when you try to twist things like this? Nowhere did ever say or even remotely provide an implicit statement that a patent pending is entirely equal to a granted patent. Nice try, Billy. You were given a chance to explain what the flying f you were actually talking about and you refused. Now Billy is having a sad because his mealy mushmouth is biting him in the crotch. This shutdown is now in its 25th day, making it the longest in American history. It’s costing the country $6.5 billion in economic activity every week, S&P Global analysts estimate. It’s threatening lives, destroying our natural heritage, and breaking the Senate even further. This is all happening against the backdrop of the news that Trump has been and may still be the subject of a counterintelligence investigation because of his ties to Russia. That’s where we’re at, and McConnell is the one person who can end this shutdown. Billy was asked to translate this into English. He refused. Now he wants to walk it back. I am doing no such thing as walking ANYTHING back – so (yet again) this amounts to you misrepresenting things. Apparently, you do not understand just what “patent pending” provides, for if you did, then you would immediately see how that very “what” impacts your provided desired “ultra-fast” processing to obtain a granted patent. Funny thing is though Malcolm, YOU were first asked to explain something and you tried to turn that request into wanting someone else to explain something else while you still have not provided the explanation asked of you. Tell everyone, Billy, the key differences between an issued patent and an allowed patent that has not been issued. Go ahead. You are still trying to do that ‘deflecting’ thing. I try to imagine what it may be like if you took the energy that you spent on deflecting and instead spent it on engaging in an inte11ectually honest manner. Is that magic boy posting? Magic boy tell us how you get new functions without new structures. It will be interesting when the losses of the shutdown start to effect the big money boyz in pharma and elsewhere. Actually, it won’t be interesting at all. The shutdown will end. What do you think is keeping the shutdown going now? It’s not accomplishing anything except the usual destruction of the government. Trump isn’t going to “win” by holding his breath and Repu k k ke s are just digging their graves, clinging to shreds, and I suppose hoping for a terr or ist attack. Patents aren’t going to be the issue that breaks the shutdown’s back. As noted above, the USPTO will maintain a skeleton crew to process initial applications, so everyone will still get their filing dates. If the shutdown goes on for three more months, for example, that’s only three months of a delay in prosecution, which still puts us far better than we were doing with the backlog a few years ago. Some people may end up getting some PTA out of it as well. The things that are going to affect the shutdown will be issues of huge public import, like airport delays from TSA sick-outs. Because separating children from their families and locking them up in cages isn’t of “huge public import” to 30% of the country. In fact, it’s of no “import” at all. Why? Brown children. F ck ’em. LOL! Funny, funny, most truthful understatement I’ve heard in a long time. So I assume there really won’t be any effect for patent practitioners, regarding a prolonged shutdown (say 3 months). Is there a point, however, at which patent practitioners will start becoming concerned? Say the patent office shutdown lasts 6 months or longer, will there become a point at which patent attorneys/agents see a reduction in workload? (e.g., due to lack of responding to office actions which aren’t going to be examined)? Will a prolonged shutdown (6 month+) have an effect of applicants considering to not even file applications? Whether or not a shutdown is present, the protections obtained (and tied to a filing date) will NOT change. RE: Is there a point at which patent practitioners will start becoming concerned? If a shutdown were to last too long, USPTO examiners may start looking for other jobs. Retention of skilled examiners is important in the long-term for a smooth examination process and overall patent quality. The comments on the political side of this are relevant, but not from the standpoint of where this falls on the USPTO operations. Not that we don’t have these interests, but hoping this doesn’t become a different flavour of a 2nd Amendment debate in the comments. That is, relevant to patent law issues. Pod Save America rolled out a pithy observation this week: “They always say the shutdown is going to last forever… right before it ends.” It’s bluffing, of the most obvious sort. One missed federal paycheck is awful. Two missed federal paychecks, you’re going to have 700,ooo federal workers (who are conveniently a short commute away from the District) parading down Pennsylvania Avenue with torches and pitchforks. And across the country, it won’t just be national parks closing – airports will start shutting down due to TSA attrition. At some point, the party in charge will be facing existential-threat levels of lost political capital, and will have to break the logjam with some kind of CR. I’m betting that it will end before January 31st. So the graphic shows the patent reserve. Is there a separate TM reserve as well? Yes, Patent and TM reserves are separate – the TM reserve is more fully funded. How is it that through the AIA, the patent office is granted a little more fee authority — with the caveat that fees must balance in the aggregate; and the mechnanism disclosed here that an unbalanced and presumptively open-ended “reserve account” can be created by the Office? Money into that account comes from applicants. How is “balance” achieved with an ability to “stash” any amount the Office may decide to stash? The Office could use the stash as a balance to up all charges across the board — and this cannot be in accord with the provision that fee authority was constrained with an aggregate (net) zero effect. …noting from the graph, this “stashing” sky-rocketed more than 500% after passage of the AIA. Anon, I have seen your past comments regarding balance in the aggregate, it appears that many of us must have vastly different understandings of what that means. If I ran a patent office that received two applications a year, and I was only able to examine one application per year for $1, and both applications were filed on January 1, I would expect that I would collect $2 in filing fees, and have $1 to pay costs now, and $1 in the bank to pay for the examination of the second application next year–literally a 100% reserve. I do not see why that is improper–I have the money saved for next year, but I also have the case saved for next year. It would be nonsensical to say, “well, I am going to spend a dollar this year, so both applications should cost 50 cents to file, so that on December 31, I have collected and spent the same for the year.” What if no applications are filed the next year? If this is your understanding, are you able to provide a citation to some evidence establishing such? Balance in the aggregate seems to mean (for example) collect from all the application filers in 2019 what it will cost (on average) to examine their applications. If it will cost 1 billion dollars to examine all the 2019 applications, that the total fees collected from application filers in 2019 should be a billion dollars. There is no such mechanism for a “follow one all the way through” type of accounting as you seem to want to take as your basis. My “in the aggregate” stems from how the pricing model of any particular item is set based on both the annual budget and expected amount of items that will be processed (for that item) IN that annual timeframe. There is a different sense of “one item through” outside of the budget calculations, which is more of a “real-world” processing viewpoint as opposed to the budget processing viewpoint. The budget processing viewpoint takes for its numbers being applied to process items an estimate of items for that task. The number that is used is NOT a “one item through the process” number. The fact that the “one item though the entire process” timing is multi-year and that budgets are strictly computed on an annual basis is why there is divergence here. With an emphasis that “process” may be a term that may carry different meanings. In other words, budgeting and pricing of process steps carries a different context from the “one item through the entire process” context. Or they could spend it on cocaine! The most important thing is to not politicize this. It would be so uncivil! Repu k k kes and glibs would be sad because of all the biased facts coming at them. Nearest that I can tell, this is your cognitive dissonance clashing with your one-bucketing, layered over top of your inability to control your feelings. Or an old bloody one. Heck, if someone takes M@ng0 down I might even bust out that champagne I’ve been saving for when D k Cheney kicks it. Oh, and f ck you, Re pu k k k es. This is 100% on you. Slapping Steve King on the wrist is way too little, way too late. Please, R’s everwhere: just blow what’s left of your dinosaur brains out and do the country (and the world) a favor. Your political rants have what to do with patent law? This is a matter of you not being able to control your feelings and having your bile spill (gush) into an inappropriate forum for those feelings. Isn’t the fact that you have had the most posts expunged for this type of thing (more than any one else; more than everyone else – combined) offer ANY clue to you? I’m rather enjoying the whole thing. Idk why you’re whining.